This personalized wooden keepsake gift box is made of natural wood, making it gender-neutral for girls and boys, and features a capped lid. A great gift idea for storage of small trinkets for a new born baby, for children's handmade memorabilia, or to fill with graduation or christening cards and presents. It is also a pretty keepsake bridal gift to store cards, little mementos, and even your wedding ring! 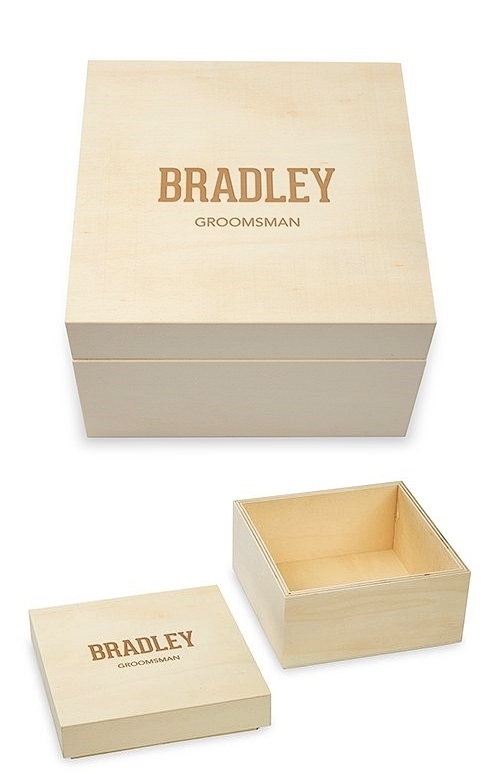 Better yet, it may be engraved with a name (or custom text line) in bold script etching and a second custom text line ("GROOMSMAN" is NOT automatically-included) in a contemporary block font.